Ownboard W1S Review – Similar or better? In our quest to review all the noteworthy boards in the Chinese budget board segment, we have gone through Meepo, Wowgo, and the Verreal. Today, we will be moving on to the Ownboard, one amongst the big-4 vendors in the Chinese budget board space. 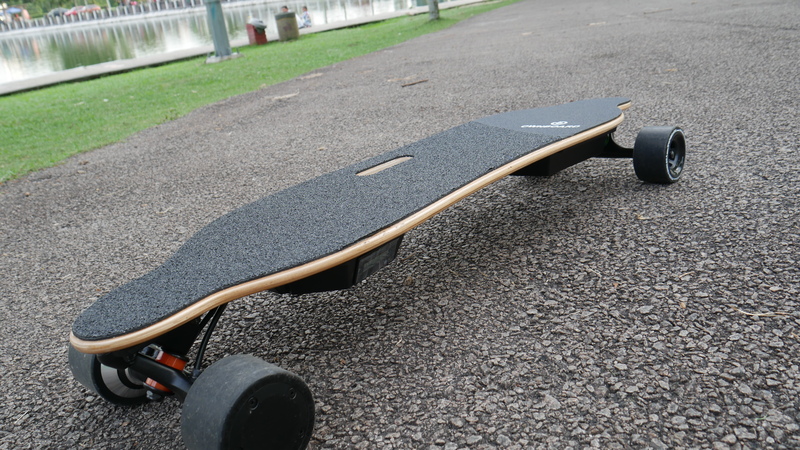 Coming into the market a little bit later than Meepo and Wowgo, Ownboard is often a second consideration after its more famous doppelganger, the Wowgo 2s. This must cause frustration for the Ownboard team, which has long been in the OEM business and is by far the more mature company of the two. In our opinion, the Ownboard W1S, the star of today’s review, is actually a better product (at least marginally) than the very similarly priced Wowgo 2S. 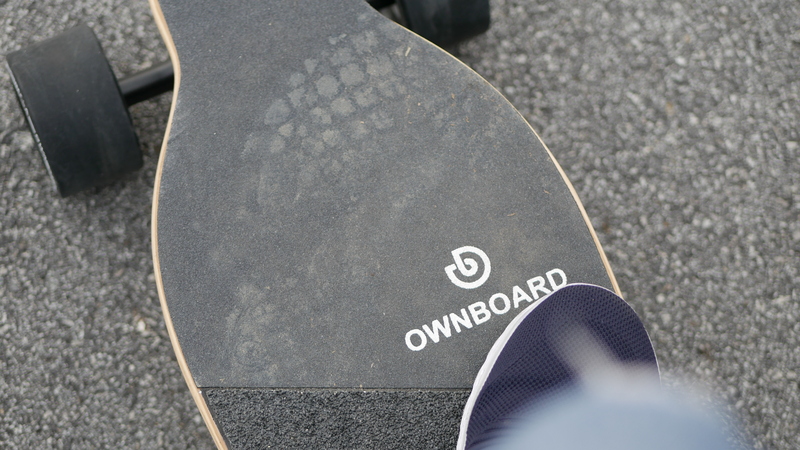 Ownboard was founded in 2013 as an OEM company for hoverboards and ‘Segways’. In 2015, they started to get into the electric skateboard business and were the manufacturer for many budget brands in the Chinese market. When the Chinese budget board craze hit the international market, Ownboard and it’s 68-man-strong company decided to create their own budget brand. 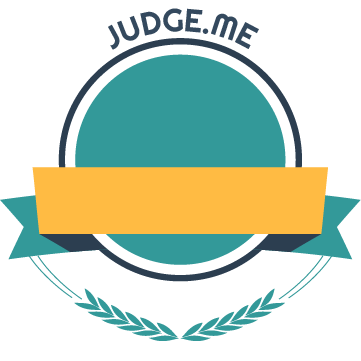 With the advantage of being a big manufacturer, they not only manage to keep up with all the iterations and upgrades offered by competitors but even eek out advantages for themselves by using superior parts. They are also one of the few companies that are able to ship to US buyers from the states themselves, an important consideration when shopping for a Chinese manufactured board (for those from the US anyway). Features: Regenerative Braking, Swappable PU Sleeves. Price: around $432 USD (after delivery fee). 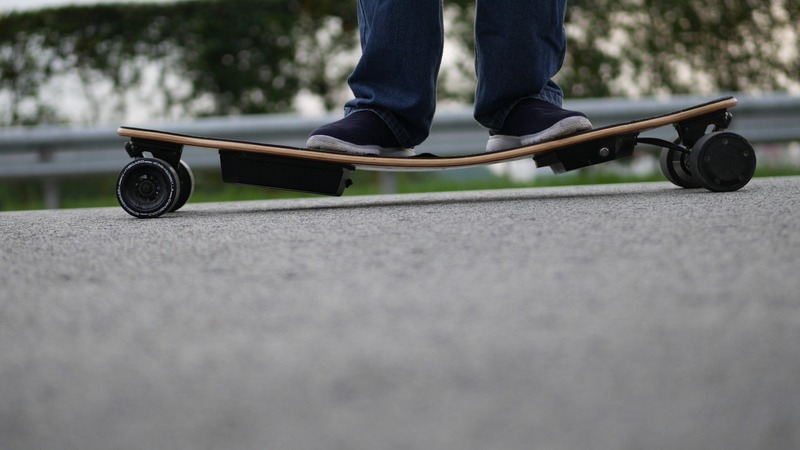 The Ownboard W1S deck is made of 6 plies of maple and 2 plies of bamboo. This gives it a slightly better flex than its Wowgo counterpart which uses only maple for its 8 ply deck. There is some camber to the deck, but no concave, unfortunately. There is an option for EVA grip tape when buying an Ownboard, which is quite noteworthy. 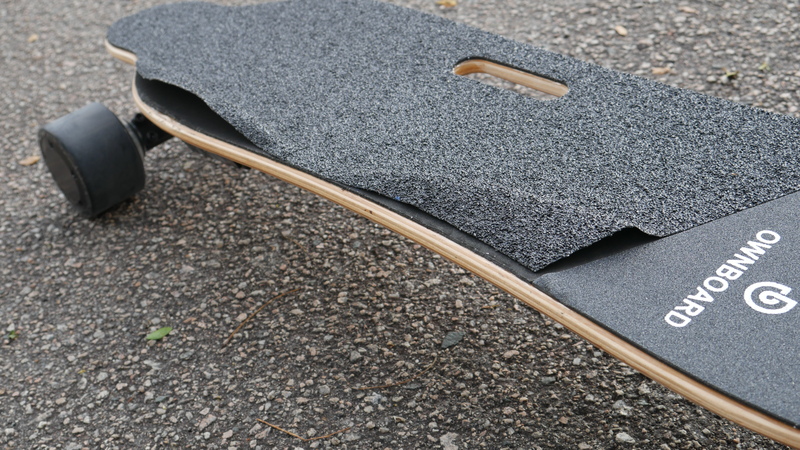 This is a setup with a 2mm-thick soft padding underneath the regular sandpaper grip tape. It may be prone to be separated from the grip tape if you abuse it. Don’t worry, it is easy to try to stick it back on. This foam padding helps to dampen vibrations from poor roads. It makes a tiny difference.. like.. 1% difference, but I ain’t complaining as every little bit helps. The Ownboard W1s uses the fairly ubiquitous dual steel enclosure. Ownboard did add something extra though, a small screen on the side to show the battery percentage. It is not by any means a game-changer but I really do appreciate knowing the exact percentage of the charge I have left. Especially when I am charging the board! No more going to the remote just to see how much the board has charged! No surprise here, Ownboard W1S uses 90mm 85a wheels. 90mm is pretty much the standard wheel size for the budget board industry at this point. For the hub wheels, you get to choose between two variants. The one with swappable PU sleeve and the one without. My review unit had the swappable PU hubs. They work well for me, I didn’t notice any weird noises or loose screws on my hubs. 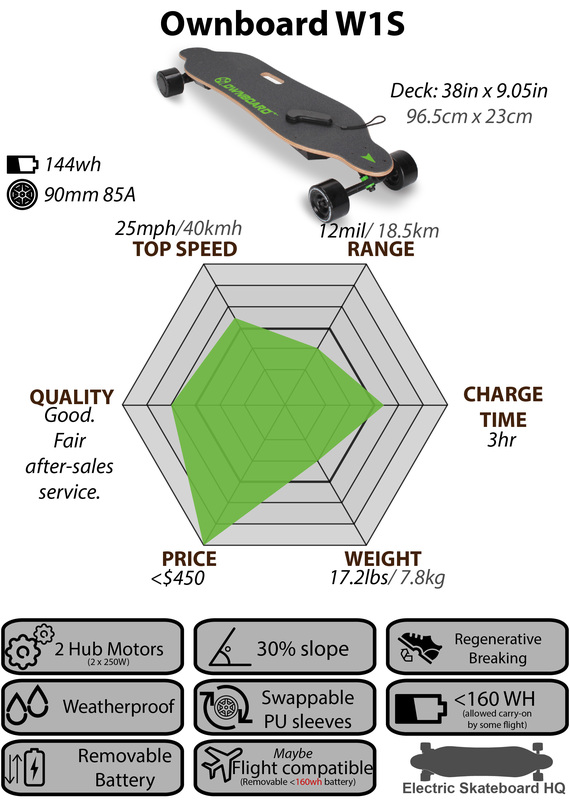 It is also worth mentioning that the Ownboard W1S comes with ceramic bearings, which freeroll significantly better than typical Chinese generic bearings. Although bearing are not the most important thing in the world when you’re not kick-pushing, it’s still a really nice upgrade to have. For the trucks, the Ownboard W1S uses paris-truck clones. They are much turnier as compare to the Chinese generic truck found on the Wowgo/ Verreal models. This is the same truck that the uses, but with nicer bushings right out of the box. Another nice touch on the W1S is that it uses harder 95A bushing on the back truck and softer 90A bushings on the front. This allows the board to turn easier while minimizing speed wobbles. However, a turnier truck often means less stability. W1S does feel less stable if ridden at high speed, but I think the tradeoff is worth it. Coming from a seasoned manufacturer, the Ownboard W1S doesn’t disappoint in product polish and packaging. Although you won’t mistake the Ownboard W1S for a premium board, it is beautiful enough to inspire confidence in its quality. The board looks good, and it feels good. You can usually the feel of a board’s controller by looking at which Electronic Speed Controller (ESC) it uses. There are two very widely used ESC in the Chinese eskate market. The HobbyWing ESC – The one used by Ownboard, Wowgo and Verreal. 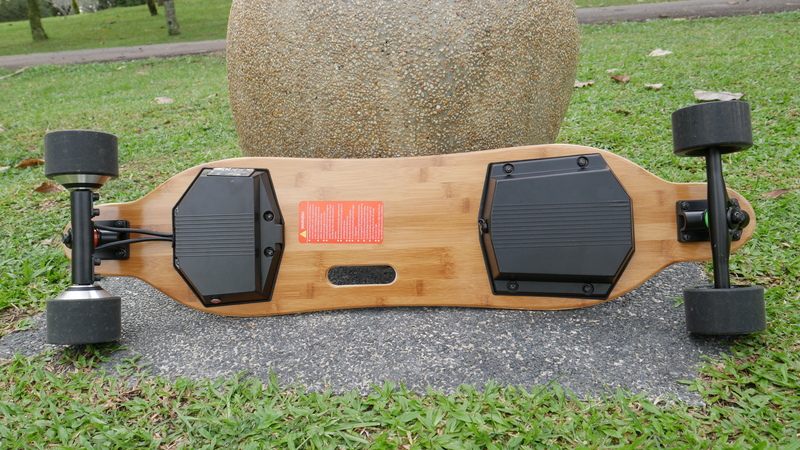 The ‘LingYi’ ESC – the one used by Meepo V2P and the Yeeplay. And when two board share the same ESC, you can bet the acceleration and braking profile is gonna be the same. W1S uses the HobbyWing ESC and this ESC is known to have the smoothest control. Some say it offers controls that are even smoother than the Boosted. 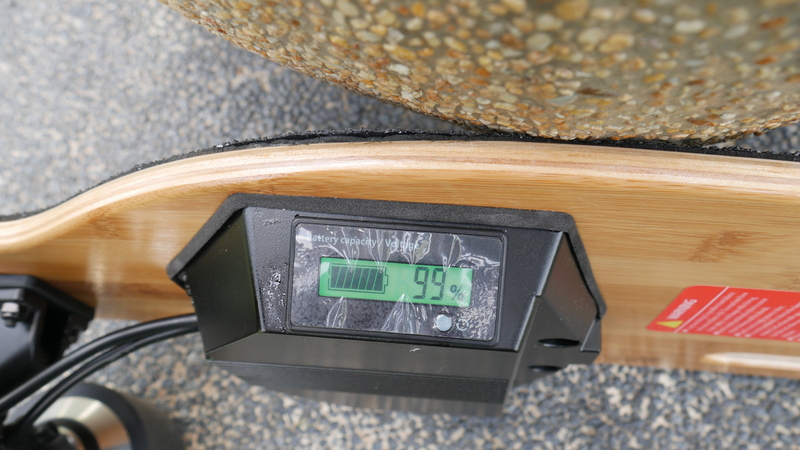 This electronic speed controller gives the Ownboard W1S a very precise, low latency, and consistent control, which makes for a comfortable ride. The precision and lack of lag are what makes the HobbyWing ESC special. You can have the board accelerate as fast as you want or as gentle as you want by controlling the throttle. The board will react instantly and precisely. This makes speed changes less scary when riding at top speed. However, if you are an absolute beginner that have poor throttle control, you might be very intimidated by the zippiness of this control. As your thumb is the only thing stopping your board from zipping off, nothing is going to stop you from pushing down too hard on the throttle and falling. This is because, by the virtue of no lag and precise control, this ESC doesn’t introduce speed ramping to smooth out speed changes. 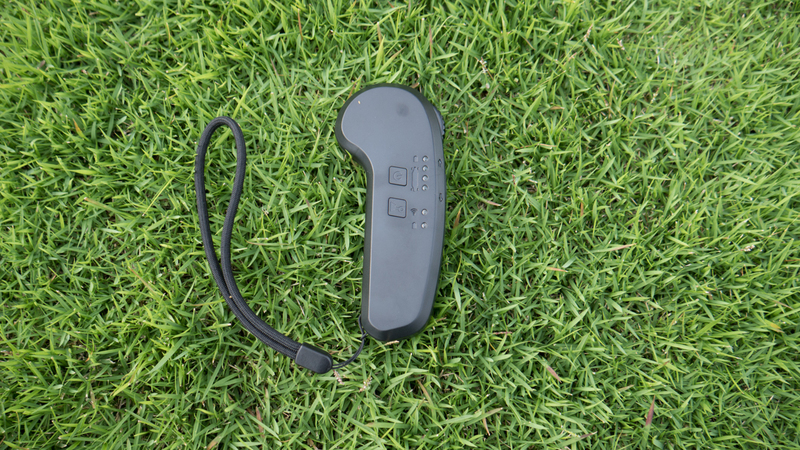 Even with that said, the majority of Eskaters end up preferring this type of controller in the long run, it just may take some getting used to in the very very beginning. Braking on the Hobbywing ESC is also one of the smoothest I have tested, with the caveat of possibly being too weak for some, and it can’t brake to a stop when going down an incline. Generally speaking, most skaters prefer this kind of smooth gentle braking but it’s a ‘bummer’ when you really need an emergency stop. I recommend all skaters learn to footbrake in order to not rely solely on electronic braking. At this point in time (end of 2018), I would recommend the Ownboard W1S over the Wowgo 2s just on the grounds of better maneuverability. This largely has to do with the truck and bushing choices. 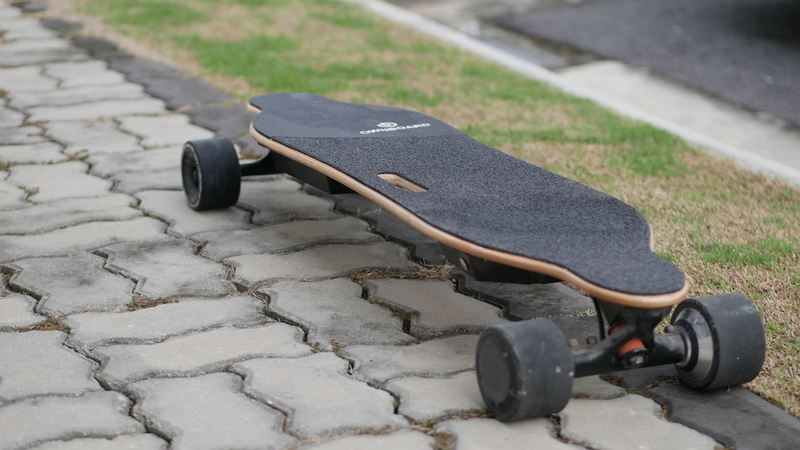 Right out of the box, the Ownboard W1s carves like a dream with its turn-y trucks and soft bushing. You can turn tighter and have a freer carve on the W1S as compared to the Wowgo 2s. And as mentioned, Ownboard put extra thought into their design and put harder bushings on the back truck to reduce speed wobble. On the flip side of the coin, however, the combination of turny trucks, with a narrow and flat deck means the W1S isn’t the most stable-feeling board. If the plan is to go top speed all the way, I wouldn’t recommend the Ownboard W1S except to the most seasoned skaters. At least not without some minor upgrades. Primarily, I would want a better deck, at least one with some concave to help my feet feel at ease. With all that said, for the way W1S is right out of the box, I will give it an A- for maneuverability and B for stability. Big wheels, slight flex on the deck, and EVA grip tape padding help the Ownboard W1S perform fairly smoothly on even rough roads. Marginally above average, I would say, slightly better than the Wowgo 2s. The Ownboard W1s uses the standard Hobbywing remote that many many other Chinese eskate companies share. It has been tried and true as a great remote. It’s ergonomic and fits nicely in the hand. The dial is springy with a good amount of resistance for better control and it has a reasonable amount of travel. The reverse switch at the side is a sliding switch so there is no way of accidentally triggering it as opposed to some other remotes which use a button. It is a simple remote without many bells and whistles and of course, no disconnection issues so far. The Ownboard W1s gives a well-rounded riding experience right out of the box. You can ride it like you stole it. Great Stability. Well, I won’t say great but it’s fair. Fair in reducing vibration from the road. As per my complaint about its doppelganger the Wowgo 2s, some feel that the Ownboard W1S is pretty bland and lacking in ‘personality’. The Ownboard W1s is on par in capability with the other Chinese budget boards. This means it has good value for money if compared to boards from any other segments. There are three battery options for the Ownboard W1S. The board that I reviewed had the 6.0AH standard battery. On a conservative ride in the top speed mode (with lots of stopping and going), I got around 13.5miles(22km) in one charge. My test might skew towards the optimistic side bearing in mind that I weigh 165lbs (75kg) and was riding in a mostly flat area in a warm climate. You probably should set your expectations at around 10miles(16km). Voltage sag is not really significant in these high-quality Samsung 30Q batteries. The real slow down happens at the last bar or around the last mile(1.5km) where the board slows to a running speed before eventually stopping. P.S, as a rule of thumb in estimating range, use the formula -> watt hour/10 = expected range in km. I can hit the marketed top speeds of 25mph/ 40kmh on a full charge. Once the battery hits 50%, the top speed will only drop marginally to 22mph/ 37kmh. Again, I weigh 75kg or 165lbs. The Ownboard W1s features dual 250W hub motors. Without any surprise, this setup allows the W1s to handle most inclines. It passed the standard stop and go test on a 15% incline. Customer service is a big part of any Eskate purchase, even for a “budget” brand. Ownboard’s customer service is generally good, but they do have their occasional slip-ups. Complaints about tracking numbers, faulty parts that took way too long to get delivered etc. There is a dedicated staff member named Phoebe who handles customer service, and her response is generally quick and helpful. So yeah, I am comfortable recommending Ownboard on the basis of strong customer service. If you are looking for a well-rounded eskate with comfortable control, the Ownboard W1s should be at the top of your list. It almost just a deck swap away from being a perfect budget eboard. Do some people prefer the Verreal F1, for its more agile ride and the stability of the dropped deck with good concave? Certainly, but the Ownboard W1s have better ‘insulation’ from vibration and a nicer carvy feel. Do some people prefer the Meepo V2’s better deck, trucks, and stronger yet harsher control? Certainly, but even more would swear by the smoothness of control that the W1S offers. Some will prefer the caliber-clone truck on the Wowgo 2s that give less wobbles, but not me. I prefer a turny truck, the ceramic bearings upgrade is also a great plus. In conclusion, as budget boards go, the Ownboard W1s sits pretty high on my list.